The Presidency on Saturday released a "list" of all the appointments made by President Buhari since he assumed office on May 29, 2015. However, the 159-member list contains several errors and omissions. At least 29 names of heads of agencies or parastatals were missing on the list. Also, according to PT, data provided for another five were incorrect. The presidency was challenged by a publication by Business Day which indicated that 81 of Buhari’s appointments are either from the North-east, North-west or North Central. In response to that report as well as several similar ones, Special Adviser to the President on Media and Publicity, Femi Adesina, released the list of 159 appointees on Saturday. Mr. Adesina then provided a graphical illustration of different states and the number of top appointees from the respective states. The graph shows that Ogun, a South-western state has the highest number of appointments with 21, followed by Imo, a South-eastern state; and Kano, a North-western state which both have 15 each. Edo, a South-south state, and the president’s home state of Katsina both have 14 appointees each. Mr. Adesina’s 159-name list indicated that the South-west has the highest number of appointments at 42, followed by North-west, 30, and North-east, 24. South-east, North-central and South-south have 22, 21 and 20 respectively. However, a closer look at the list provided by Mr. Adesina show several omissions and errors. The Director-General of the Federal Radio Corporation of Nigeria, FRCN, Mansur Liman, who is from Mr. Buhari’s hometown of Daura is omitted from the list. Also omitted is Yakubu Ibn Muhammed, from Bauchi State, who was appointed as the Director General of the Nigerian Television Authority. The Senior Special Assistant, SSA to the President on Social Investment Programmes, Ismael Ahmed, who was appointed by the Vice-President, Yemi Osinbajo, while Mr. President was out of the country, is also missing on the list. Mr. Ahmed is from Kano, North-west. It is not clear if this omission was deliberate as the announcement was done by Mr. Osinbajo. Also missing are Nasir Saidu Adhama, Special Assistant on Youths & Students Affairs; Abdulrahman Bappa Yola, Special Assistant in the Office of the Vice President; and Bashir Ahmed, Personal Assistant on New Media, all from Kano. On September 26, 2016, President Buhari announced appointments of executives for 13 federal government agencies. However, only seven of them are reflected in the Presidency list. Missing are; Joseph Ari, Director-General, Industrial Training Fund; Simbi Wabote, Executive Secretary, Nigerian Content Monitoring Board; Aboloma Anthony, Director-General, Standards Organisation of Nigeria; Mamman Amadu, Director-General, Bureau of Public Procurement; Ahmed Bobboi, Executive Secretary, Petroleum Equalization Fund and Sa’adiya Faruq, Federal Commissioner, National Commission for Refugees, Migrants and Internally Displaced Persons. In a widely-reported appointment, President Muhammadu Buhari in April 2017, approved the appointment of Abubakar Abba Bello as the new Managing Director of Nigeria Export-Import Bank (NEXIM). His name was also missing from the list released on Saturday. On July 29, 2016, the Director Press of the Secretary to the Government of the Federation (SGF) Bolaji Adebiyi, in a statement said the President has approved the appointment of new heads of five agencies in the Federal Ministry of Health. Interestingly, four of the five are missing in the latest presidency list. Not mentioned in the Presidency list are Babatunde Salako, the Director-General of National Institute for Medical Research from Ogun State; and Chikwe Ihekweazu, the coordinator of National Centre for Disease Control appointed in August 2016. Also omitted are: Echezona Ezeanolue the Executive Director of National Primary Healthcare Development Agency; Usman Yusuf, the DG of National Health Insurance Scheme, who was recently suspended; and the Director-General, National Agency for the Control of AIDS, NACA, Sani Aliyu. Also missing from the list are the Managing Director, Federal Roads Maintenance Agency, FERMA, Nurudeen Rafindadi from Katsina; Chairman, Board of the FCT Internal Revenue Service, Abdullahi Attah; and Bayo Somefun, Managing Director, Nigeria Social Insurance Trust Fund. Others are, Luci Ajayi, Executive Secretary, Lagos International Trade Fair Management Board; and Emmanuel Jimme, Managing Director, Nigeria Export Processing Zones Authority. Apart from the missing names, however, some of those listed were wrongly described. The presidency list claimed that the Comptroller-General of Nigeria Immigration Service, NIS, is from the North-central. But checks by PREMIUM TIMES found this to be wrong. The Immigration boss hails from Jigawa, a North-western state. The presidency list identified the wife of PDP chieftain, Bode George, Roli Bode-George as the CEO of Nigeria Drug Law Enforcement Agency, NDLEA. The list also claimed the BusinessDay list wrongly identified her as Muhammad Abdullah. However, a further check grossly put the presidency in the wrong. Mrs. Bode-George is not the CEO of the agency. In November 2015, she was appointed acting chairman of the agency, a position she occupied for 54 days before Muhammad Abdullah, a native of Adamawa State, was appointed as substantive chairman on January 19, 2016. Maryam Uwais who was appointed as President Buhari’s Special Adviser for Social Protection Plan was listed to have hailed from North-central; but a further check signifies that the wife of former Chief Justice of Nigeria, Muhammadu Uwais is from Kano State. 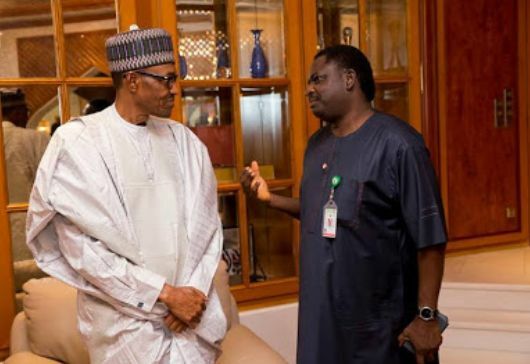 We watched Femi Adesina on tv on Sunday night and he confirmed that the the list is not exhaustive.